The rebuke to President Trump comes after his dismissal of an intelligence assessment that concluded the Saudi crown prince likely ordered Khashoggi murder. WASHINGTON — The Senate on Wednesday delivered a strong bipartisan rebuke to President Donald Trump's policy on Saudi Arabia by overwhelmingly voting to advance a resolution that would end all U.S. involvement in the Saudi-led war in Yemen. The 63-to-37 vote came after a contentious administration briefing on the war, a discussion that also addressed Saudi involvement in the murder of journalist Jamal Khashoggi. The Senate move came in the wake of Trump's dismissal of an intelligence community assessment that concluded Saudi Crown Prince Mohammad bin Salman most likely ordered Khashoggi's murder, a presidential position with little support on either side of the aisle in Congress. The growing concern in the Senate was apparent in the vote tally as the Senate rejected the same resolution nine months ago. The worsening humanitarian crisis in Yemen also played a role in senators' frustration with the ongoing war there, in which the U.S. is supplying Saudi Arabia with weapons and support to fight the Houthi rebels. The measure, pushed forward by Sens. Bernie Sanders, I-Vt., Mike Lee, R-Utah, and Chris Murphy, D-Conn., would invoke the War Powers Resolution, inserting Congressional oversight into overseas conflicts. It would end U.S. involvement and military assistance to the war in Yemen, where more than 85,000 children have died because of a war-induced famine in the country and millions are on the brink of starvation. UNICEF has declared it the worst humanitarian crisis in the world. She and 18 other senators switched their votes from the last time the measure was voted on in March when it failed by six votes. Fourteen Republicans joined all the Democrats in supporting it. "I changed my mind because I'm pissed," Graham said. "I don't agree with what (Lee and Sanders) are doing. I don’t think the War Powers Act is one, constitutional, (and) two, the aid we provide to Saudi Arabia and Yemen would require an authorization to use military force. Having said that, the way the administration has handled the Saudi Arabia is just not acceptable." The procedural vote was just an opening act, however, and doesn't mean that it will clear the Senate when the Upper Chamber will vote to open debate on the issue next week. Sen. Bob Corker, R-Tenn., and outgoing chair of the Senate Foreign Relations Committee said he voted to advance the measure to give a signal to the Trump administration, giving them one week to change course. “As I said to the administration again this morning, it’s my hope that they will figure out a way to bring American interests and American values into balance, and they can cause a Saudi Arabian government to take appropriate ownership over what has happened in the killing of this journalist," Corker said. Sen. Bob Menendez of New Jersey, the top Democrat on the Senate Foreign Relations Committee, called Haspel's absence "a cover-up." "It’s outrageous that the Senate can be stonewalled from hearing from the CIA director," Menendez said. CIA Press Secretary Timothy Barrett said Haspel didn’t attend because the CIA already briefed the Intelligence Committee and congressional leadership and "will continue to provide updates on this important matter to policymakers and Congress," adding that "the notion that anyone told Director Haspel not to attend today's briefing is false." The administration is also downplaying any connection between bin Salman and Khashoggi’s murder, a connection that the intelligence community, with "high confidence," has concluded exists. Pompeo told reporters on Capitol Hill after he briefed senators that "there is no direct reporting connecting the crown prince to the order of the murder of Jamal Khashoggi." 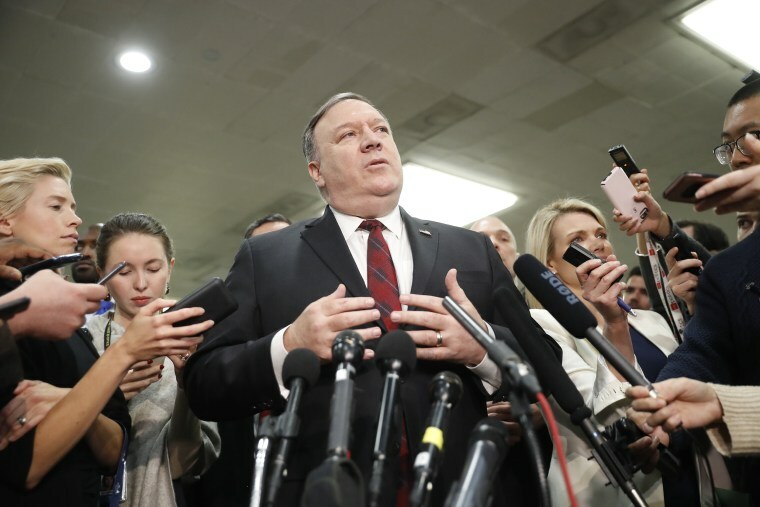 Pompeo also urged senators to vote against the Yemen resolution, saying the timing is bad because they are "on the cusp" of all parties coming to the table for a potential cease-fire. The Senate will continue debate on the measure next week. If the Senate passes it, the House must also pass it before it could be implemented. House Republicans rejected a similar measure in November.